We have announced our new Hope for Health and Nutrition Initiative designed to raise awareness about the high levels of obesity, diabetes, hypertension, and heart disease in the community while helping to provide new solutions, enhance current solutions, and improve the general understanding of the benefits of a healthier lifestyle. More than 140 guests attended a private fundraiser hosted by Dr. Daniel and Marlena Husted at their grand waterfront home overlooking the St. Lucie River. Dr. Daniel Husted, a prominent orthopaedic surgeon in Stuart, and his wife Marlena, appealed to their extensive connections within the medical community aiming to raise support and awareness for House of Hope’s rapidly growing health and nutrition initiatives. The program focuses on improving the community’s health via nutrition education, cooking and gardening classes, along with enhanced access to a variety of fresh produce via the agency’s four Client Choice pantries and partnering agencies. In some low-income communities in Martin County, as many as 60 percent of residents suffer from obesity and related chronic illnesses. 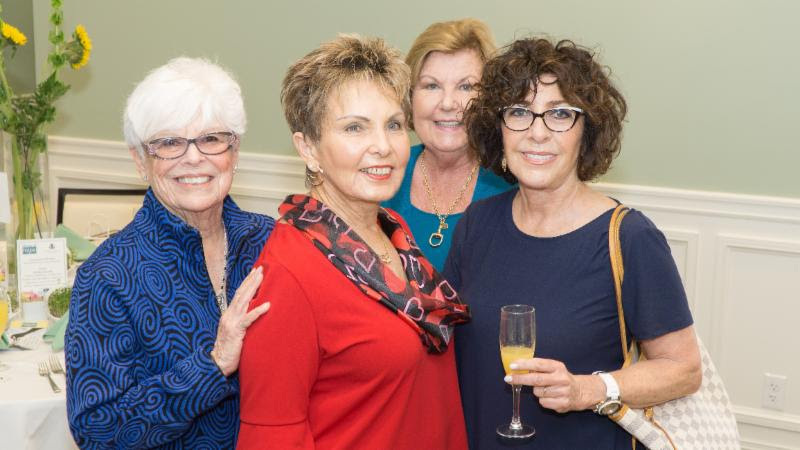 House of Hope’s largest fundraiser celebrated its 20th year Jan. 31, 2019, at Piper’s Landing Yacht and Country Club in Palm City. The sold-out event featured a gourmet lunch, complimentary mimosas, unique raffle baskets, pop-up House of Hope thrift boutique, and the Growing Hope farm stand. House of Hope CEO, Rob Ranieri’s presentation took guests on a milestone-studded journey from the agency’s humble beginnings to current day accomplishments including several upcoming developments for House of Hope’s nutrition initiatives and vocational training offerings. The crowd applauded recent successes including the Golden Gate Center for Enrichment’s first year of operation, the first harvest of the East Stuart Community Garden, and phase two of construction beginning at the Agricultural & Vocational Production Farm in Palm City. For the rest of the story, visit the Hearts for Hope page. Photo galleries of the event may be found on House of Hope’s Facebook page @hohmartin. On the chilly afternoon of Nov. 27, House of Hope and the City of Stuart proudly invited the community and several local notables to celebrate the official opening of the all-new East Stuart Community Garden located at 520 SE Florida Street in Stuart. The newly cleared and fenced area features a series of raised garden beds and trellises which will function as part of House of Hope's Gardening to Grow Healthy Children and Families program focusing on increasing awareness of the health benefits of good nutrition and the basics of gardening. 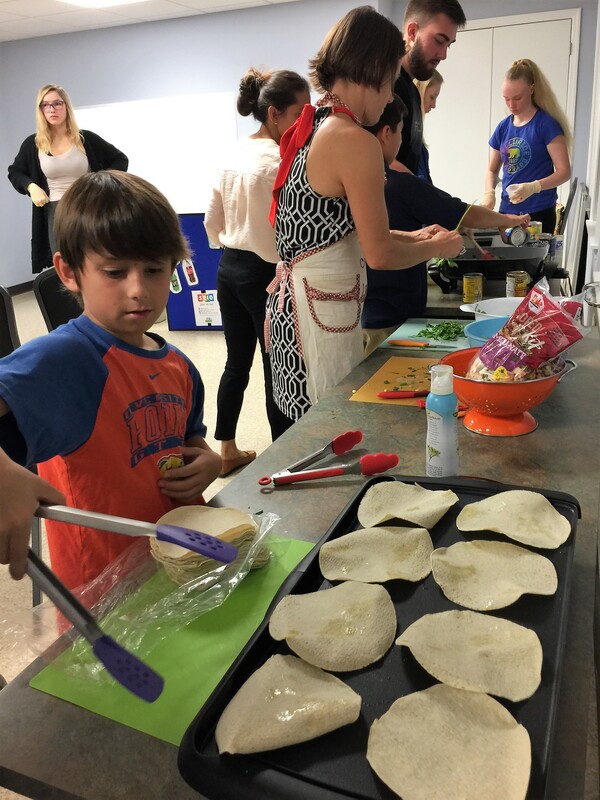 The program strives to change unhealthy eating habits and encourage a more active lifestyle through healthy cooking classes, demonstrations and gardening activities. The East Stuart Community Garden has been made possible through a collaborative effort between House of Hope, the City of Stuart, Children’s Services Council and several private donors. For more information about House of Hope’s nutrition gardens, click here or contact the agricultural coordinator, Laura Lyman at (772) 286-4673 x 1018. 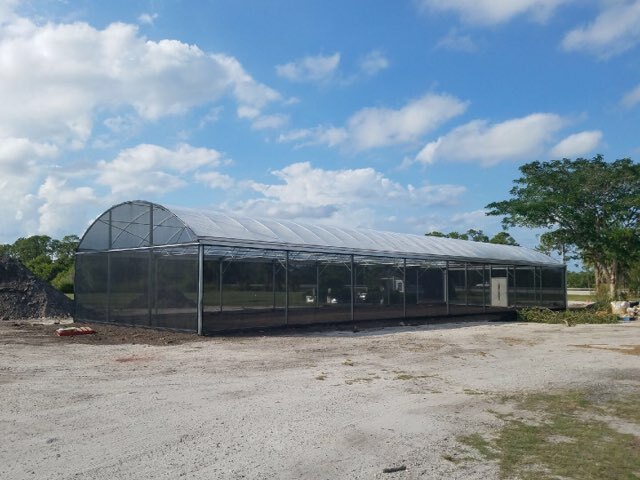 Our large greenhouse is now under construction, and at full operating capacity up to 4,000 pounds of fresh produce will be harvested monthly and distributed to House of Hope clients, local soup kitchens, and economically challenged communities. This project sits nestled behind the all-new Palm City Farms Produce & Market on land generously set aside by the owenrs, the Dawson Family. Not only will the farm provide an abundance of healthful fresh fruits and vegetables, it will also offer individuals the opportunity to obtain agricultural job skills and gainful local employment through House of Hope’s vocational training program. The focus of the Nutrition Gardens and the Agricultural Vocational Production Farm is to increase community awareness of the health benefits of good nutrition, increase client consumption of healthy fruits and vegetables, and provide knowledge about the basics of gardening, while helping to reduce Martin County’s high rate of diabetes, childhood and adult obesity, and other chronic illnesses. It may seem a tad early, but House of Hope is in desperate need of holiday food contributions. 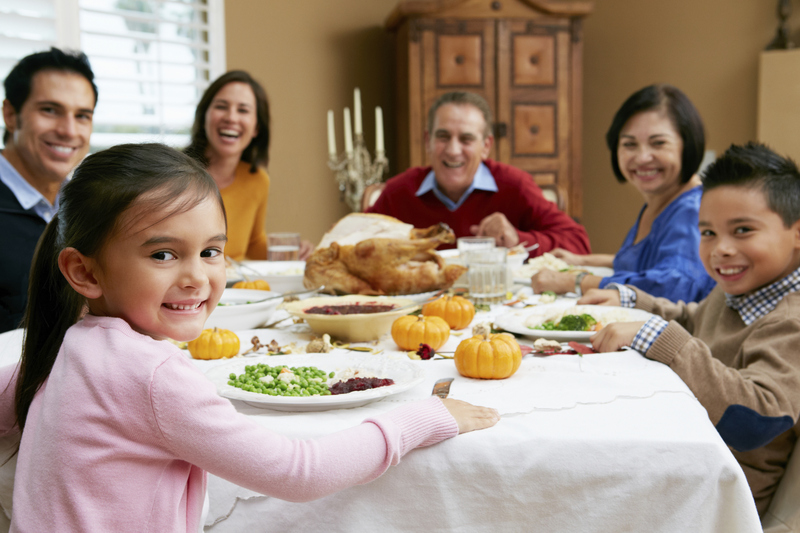 In order to provide holiday meals to eligible Martin County families, we need time to collect, sort, distribute, and have families thaw their turkeys in time for Thanksgiving. We are now accepting donations of frozen turkeys, grocery store gift cards, and monetary contributions to assist in providing Thanksgiving meals to the hundreds of local households in need. Frozen turkey and/or gift card drop off at pantry locations. Sign up your business/group to conduct a Holiday Drive. With new milestones being reached almost monthly this past year at House of Hope, staff and volunteers are now celebrating the agency’s most significant rating from Charity Navigator- a coveted four star score of 98.23 percent. By measuring House of Hope’s transparency, efficiency, financial stability and integrity, America's largest and most-utilized charity evaluator has deemed House of Hope to be the highest ranked organization on the Treasure Coast. While the agency has maintained a four-star status consistently since 2014, the latest score has tied House of Hope for eighth place in the state of Florida and granted the 11th best numerical ranking in the nation among Human Services organizations with a Social Service focus. "We are proud of the fact that our supporters can trust House of Hope to be responsible stewards of every dollar and donation as we strive to empower Martin County residents to overcome hunger and hardship, ” House of Hope chairman of the board, Stephen Schramm, said. "We continuously strive to enhance our agency’s impact and Charity Navigator’s independent scrutiny has once again led to earning another four-star rating and stellar score." 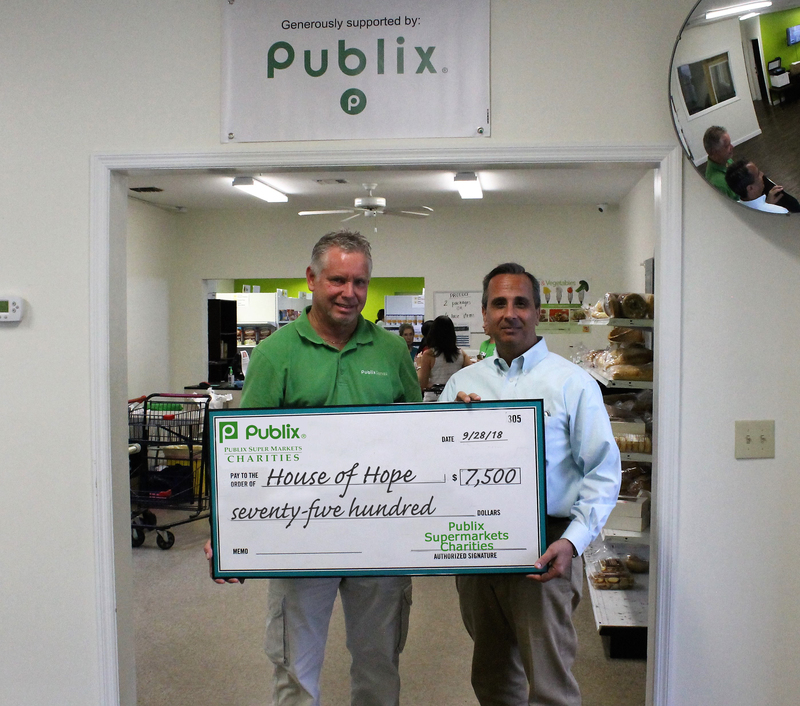 Publix Super Markets Charities has awarded $7,500 to House of Hope in support of the agency’s Elisabeth Lahti Nutrition Center in Stuart. The generous contribution will be quintessential in providing healthier food choices and the opportunity for a more nutritious lifestyle for thousands of Martin County residents served by House of Hope’s four Client Choice pantries. In addition to preparing fresh salads and sandwiches made available daily to clients, the Nutrition Center also processes, packages and freezes excess produce and meats in order to provide protein-rich food year-round. Tens of thousands of pounds of locally grown fresh produce such as potatoes, peppers, and corn that are gleaned (picked and donated) from area farms are also processed in the Nutrition Center and distributed throughout the pantries. There is never a cost to anyone seeking food or other assistance from House of Hope. This important grant awarded by Publix Super Market Charities will furnish the Elisabeth Lahti Nutrition Center with packaging supplies, commercial gleaning bins, pantry food acquisitions, House of Hope's food distribution truck’s maintenance, and more. House of Hope CEO Rob Ranieri remarks, "Publix continues to make a difference in the lives of the families that House of Hope reaches. This grant from Publix Super Markets Charities is the latest example of their caring corporate culture and their willingness to support us we work to empower Martin County residents to overcome hunger and hardship." Support for House of Hope’s nutrition initiatives and Elisabeth Lahti Nutrition Center helps to provide access to healthy foods in under-served communities which is a cost-effective way to reduce chronic disease in the populations most affected by them. By easing food insecurity and ensuring House of Hope clients have nutritious food on their tables, the Client Choice pantries may improve health, reduce health care costs, reduce the number of missed days from work and school, and improve the overall wellness of our community. Locally-famous Holiday Store Opens to Support Project H.O.P.E. 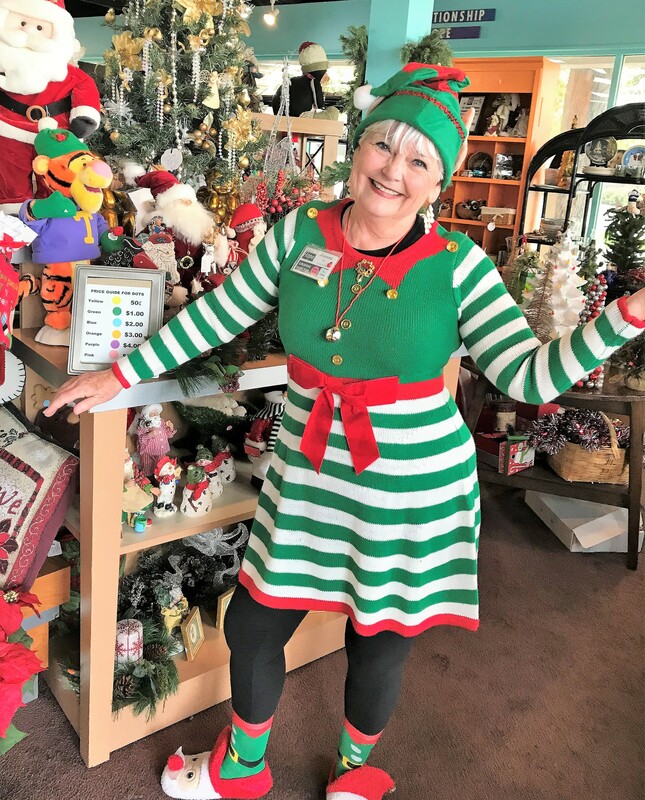 Throughout the year, dozens of House of Hope volunteers sort and set aside all holiday-themed donations in order to create the locally-famous House of Hope Holiday Store. Most items are priced below $5 including complete Halloween costumes, fall and winter holiday decor, housewares and more. The inventory changes throughout the day as dedicated volunteers unpack hundreds of stored crates full of their curated merchandise to restock the shelves as it flies out the door. Why: 89 cent of each dollar spent in House of Hope's thrift stores funds Project H.O.P.E. (Helping Others Progress through Empowerment) serving thousands of Martin County residents each month by providing food, financial assistance, clothing and housewares, information and referral, case management, school supplies, enrichment opportunities, job coaching and more. House of Hope received a $4,000 grant from Westfield Insurance Foundation thanks to an ongoing collaboration with Stuart Insurance. Stuart Insurance’s own Margaret Kiess has been volunteering in House of Hope’s Client Choice pantry in Stuart for the past five years and her active participation serves as a conduit between the agencies. Paired with Stuart Insurance’s repeated holiday contributions to House of Hope, their ongoing support has been essential in Stuart Insurance’s grant nomination for House of Hope. The grant is part of the Westfield Legacy of Caring program in which Westfield Trilogy agencies across the country were invited to nominate a local nonprofit focusing on family stability or safety. This funding will help Project HOPE address the issues of local poverty, hunger, homelessness and unemployment by providing individual case management services which establish personal goals to guide people toward self-sufficiency; provide nutritious food and nutrition education to increase healthy living habits; provide financial and other forms of assistance, and offer basic life and career skills training opportunities through House of Hope’s innovative job training program, offering motivated individuals marketable skills to earn a living wage. With a focus on the unemployed, those who work for low wages and exist paycheck to paycheck, support for Project HOPE will help to stabilize individuals and families while aiming to break the cycle of poverty. House of Hope’s longtime Partner in Hope, Macy’s Jensen Beach reached a new milestone in giving through their annual Bag Hunger campaign. Macy’s supported House of Hope in three impactful ways: monetary contributions, non-perishable food donations and volunteerism. House of Hope’s landmark program, the Golden Gate Center for Enrichment, has published the summer schedule of expanded offerings now available to the community at no cost. The new summer programming aims to provide something for everyone with unique educational activities for families and individuals wishing to beat the heat while enhancing their education, earning potential, financial stability and/or goals for better health. The 26th Annual Stamp Out Hunger food drive supplied over 42,000 pounds of food to House of Hope — the equivalent of nearly 35,000 meals for Martin County residents in need. The nation's largest one-day food drive was conducted across the county today and is organized annually by the National Association of Letter Carriers. Donations collected in Martin County help to restock House of Hope’s four Client Choice pantries—Stuart, Hobe Sound, Jensen Beach and Indiantown — with much-needed items such as canned vegetables, soup, tomato products, pasta, cereal, etc. The timing is critical for local residents who are experiencing seasonal unemployment or decreased hours as well as school lunch programs ending for the summer. Hundreds of volunteers donated their time on Saturday to help sort the influx of donations from local residences. Local postal carriers generously signed on to participate by collecting thousands of donated bags of food from their routes while also delivering the mail. House of Hope has many groups and individuals to thank, starting with the National Association of Letter Carriers Branch 1690 and the thousands of local residents who put food by their mailboxes to contribute to the drive. Two shifts of Stamp Out Hunger volunteers were stationed at the Palm City, Stuart and Stuart Annex, and Hobe Sound postal offices to load the collected food into trucks transported by volunteer drivers to the Martin County Fairgrounds. At the fairgrounds, hundreds of volunteers including the following groups sorted tons of donated non-perishables: Edgewater Property-Realty, Martin County High School Football Team, The Chinese Club from Jensen Beach High School, Holy Redeemer Catholic Church, United Way of Martin County’s Leaders United, and House of Hope volunteers. In addition to the hard-working volunteers, the daylong event could not happen without support from community-minded sponsors including Circular Recycling, Hooks Construction, Waste Management, Cassidy’s Ice, Manero's Restaurant, Martin County Fairgrounds, Impact Designs, Crary Buchanan Attorneys at Law and Brooklyn Joe’s Italian Restaurant. Local agencies have partnered to bring the renowned “Bridges Out of Poverty” community support program to Martin County. This multifaceted model actively involves the public, law enforcement, social service agencies and their clients to participate in learning the effect that poverty has on the entire community and provide a better understanding of how to help people move out of poverty. Hosted by House of Hope and funded by the Martin County Community Foundation’s Francis Langford Fund, the Law Enforcement Training segment of the Bridges Out of Poverty program took place May 11 at the City of Stuart Police Department. The law enforcement element of the training stems from Jodi Pfarr’s industry-standard book, Tactical Communication, which guides first responders to better utilize communication skills to control the scene, stay safe, and garner cooperation and respect with the people they encounter from all socio-economic backgrounds. The workshop is tailored to help first responders understand the driving forces in poverty in order to be more effective on each call and receive fewer complaints. Having local law enforcement eager to learn from this course is a critical component to the effectiveness of the program overall given their daily interaction with the community and various situations they are tasked with managing. President and CEO of the Martin County Community Foundation, Elizabeth Barbella adds "Our local experts identified this investment as essential to enhancing the way organizations and first responders, including law enforcement, interact with and empower those who are struggling to overcome poverty and hunger to achieve stability and self-sufficiency. We salute House of Hope for taking a leadership role in guiding this game changing work for our community and applaud our local law enforcement community for embracing this valuable opportunity." Other components of the Bridges Out of Poverty curriculum have been underway since early this year including a series of poverty simulations which invited the general public to participate. Local leaders and influencers who were in attendance consistently reported that the experience was enlightening and important as it has inspired a different outlook and concern for the community around them. House of Hope will soon be rolling out the client portion of the training, “Getting Ahead in a Just Gettin' By World” which is a facilitated program to help individuals build their own personal plan to get out of poverty and create sustainability. The objective is to provide an all-inclusive learning program that will benefit the individual and the community. The second annual Top Chef Martin County benefiting House of Hope turned up the heat April 14 with a packed audience of longtime supporters and many newcomers cheering on the feisty cooking competition while enjoying music and dancing, gourmet tasting stations, boutique shopping and highly coveted raffle prizes. Local amateur chefs Dina Roosth, Melissa Zolla, Dr. Brian Moriarty, Jennifer Stull-Wise and Tina Kraft spent weeks leading up to the event raising funds to support House of Hope’s mission to empower Martin County residents to overcome hunger and hardship. The overall score was determined by combining individual fundraising tallies with culinary scores. The expert judging panel comprised of Jason Stocks (chef/owner of District Table & Bar), Rachel Pias (chef/owner of Banyan 320) and Adam Fetterman (2017 Top Chef Martin County victor) determined the winners. 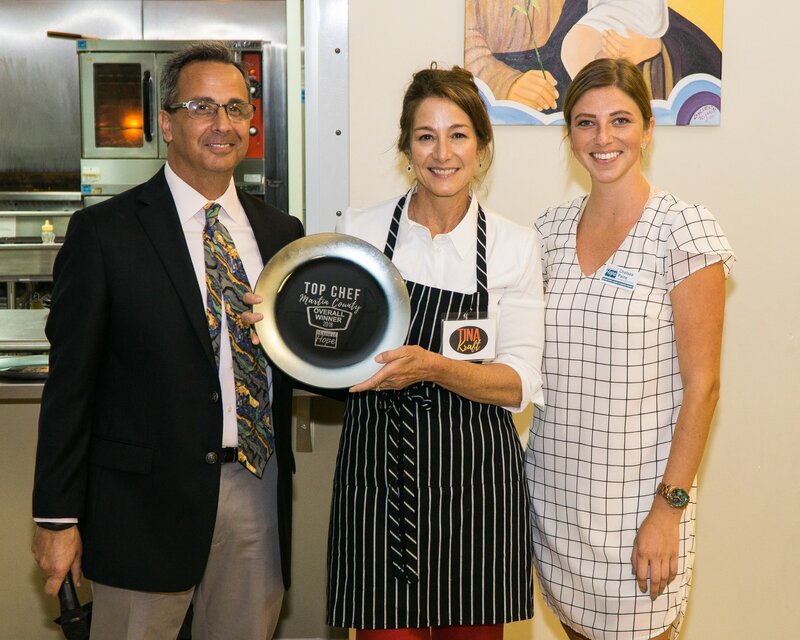 With her own take on “gamberi e grits” or Italian shrimp and grits, local artist Tina Kraft was named Top Chef Martin County Overall Winner. She also took home the honor of Best Dish for the highest individual points scored on her preparation. Fellow contender Dina Roosth was awarded the honors for Top Fundraiser, having raised over $10,000 for House of Hope’s mission. Each of the competitors submitted fabulous dishes resulting in very close scores across the board. House of Hope thanks the following community-minded sponsors: Loving Chiropractic of Stuart, Andy and Lorraine Popky, Circular Recycling, Wallace Mazda, Jim & Elaine Matts, The Firefly Group, FPL, Deborah Lovequist, The Wong Family Foundation, Patricia Churchill, Gordon & Doner, Advanced Diagnostic Group and Whiticar Boatworks. ﻿House of Hope volunteers and staff from across the nonprofit’s multiple locations gathered for the agency’s annual Volunteer Appreciation Breakfast. 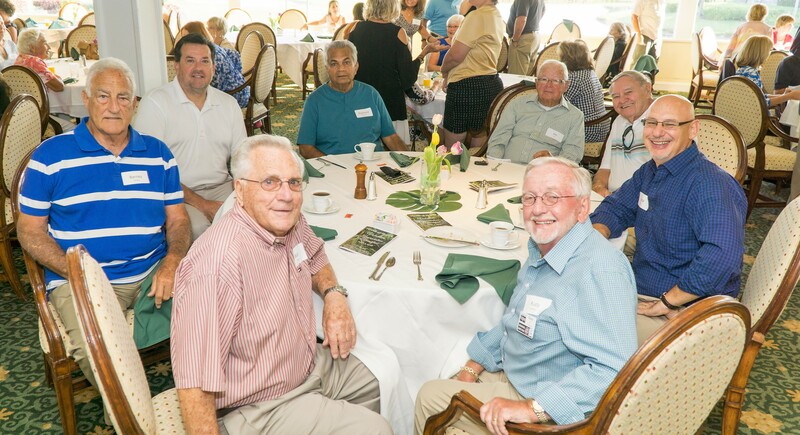 The April 4 event was well attended by over 130 guests who were treated to an impressive breakfast at Mariner Sands Country Club in Stuart. House of Hope relies on the energies of volunteers to operate its four Martin County Client Choice food pantries, four thrift stores, Elisabeth Lahti Nutrition Center, six nutrition gardens, production farm as well as assisting with special events and office tasks. Many volunteers are currently training for enhanced roles as career coaches and homework helpers for the agency’s Golden Gate Center for Enrichment. It's a simulation, not a game. 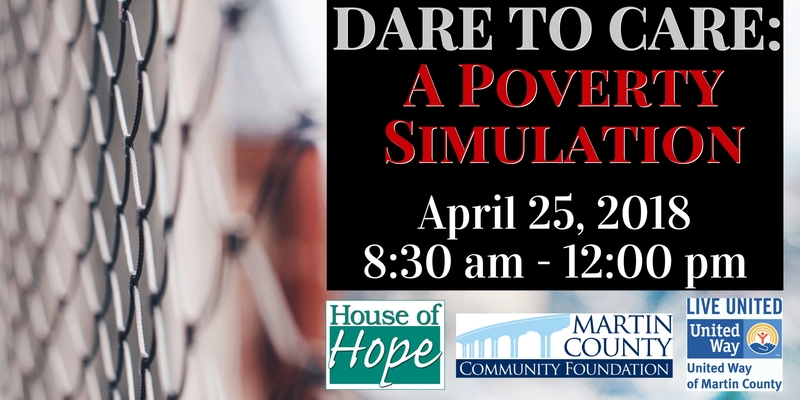 House of Hope, Martin County Community Foundation, and the United Way of Martin County are collaborating to host “Dare to Care: A Poverty Simulation” workshop Wednesday, April 25, 2018, from 8:30 a.m. to 12:00 p.m. at the IRSC Chastain Campus in the Clare & Gladys Wolf Technology Center located at 2400 SE Salerno Road in Stuart. Participants will be assigned an identity and typical circumstances of someone who is facing poverty in order to experience how dynamic and interwoven the common challenges are for local residents. The task is to obtain food, shelter, and other basic necessities by accessing various community resources during the course of four 15-minute "weeks." They will interact with volunteers posing as service providers such as agency workers, law enforcement, teachers, government entities, employers and more. 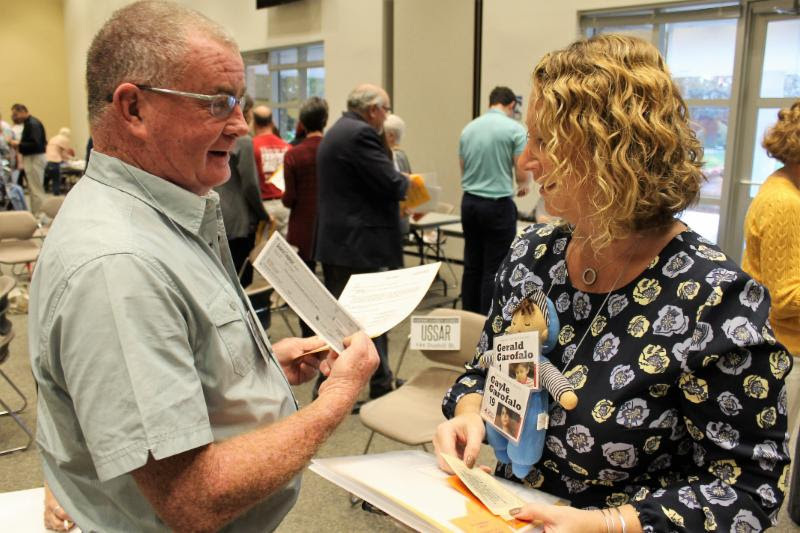 This inclusive simulation will challenge perceptions and perspectives, inspiring new understanding and empathy for what so many fellow Martin County residents face. The event is limited to 80 participants and space is filling up fast. Check-in begins at 8:30 a.m. and light refreshments will be served throughout the day. To register for the Dare to Care Poverty Simulation, CLICK HERE or call Lauren Mustelier at (772)286-4673 x 1004. 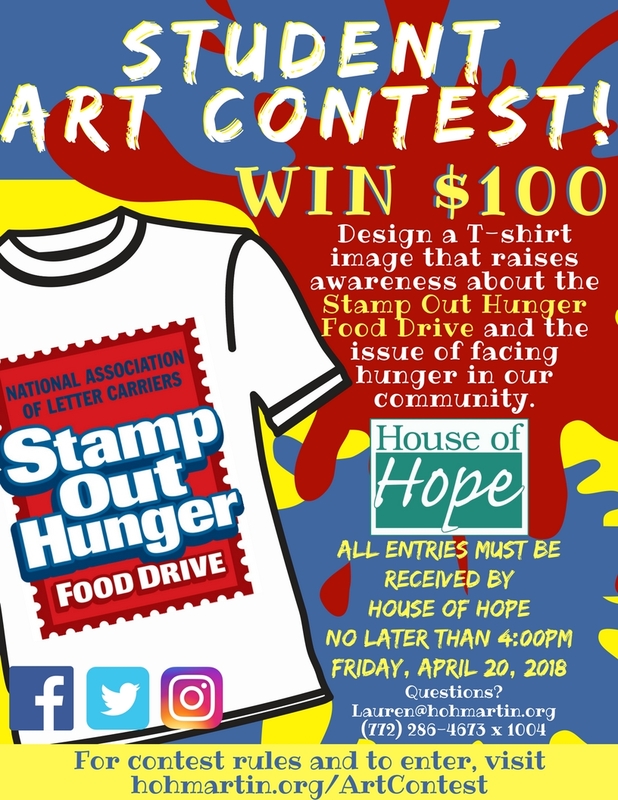 House of Hope is excited to invite Martin County students to participate in the first ever “Stamp Out Hunger Student Art Contest.” Student artists are asked to use their creativity and talent to help raise awareness about the National Association of Letter Carriers’ Stamp Out Hunger Food Drive and the issue of hunger facing our community. All contestants will be invited to attend the Stamp Out Hunger Kick Off Party at House of Hope May 9th, 2018 where the art contest winners will be announced. Three grand prize winners will receive a $100 Visa gift card, a t-shirt with their artwork, and a plaque of recognition. The three winning pieces will also have their artwork printed on limited edition t-shirts and other items that will be available to purchase and/or order. More than 150 guests attended a private fundraiser thrown by Dr. Daniel and Marlena Husted in support of House of Hope’s nutrition garden programs at their grand waterfront home Saturday, Feb. 24, 2018. A clarinet foursome musically set the mood as the crowd gathered within the Husted’s extensive fountain-centered garden while they sipped libations from the Tito’s Vodka Martini bar. The weather was perfect, the venue exquisite, and the attendees were dressed to thrill. Dr. Daniel Husted, a prominent orthopaedic surgeon based in Stuart, and his wife Marlena, appealed to their extensive connections within the medical community aiming to raise support for House of Hope’s rapidly growing nutrition initiatives. The program focuses on improving the community’s health via nutrition education, cooking and gardening skills, along with enhanced access to fresh produce via the agency’s four Client Choice pantries. Martin County has high levels of childhood obesity -- more than 30% -- and in certain economically challenged communities, that number is a high as 60%. With these same communities struggling with higher-than-normal rates for adult diabetes and other obesity-related illnesses, growing support from the local medical community provided a logical strategy. House of Hope and 200 smiling guests celebrated the 19th Annual Hearts for Hope Luncheon Jan. 25 at Piper’s Landing Yacht and Country Club. The event’s new theme emphasized “Our Bountiful Community.” In the spirit of House of Hope’s flourishing nutrition gardens and health initiatives, the agency included several community minded growers and artisans as part of an organic green market to help showcase the variety of healthy resources in Martin County. The exclusive green market offered a variety of locally grown organic produce, fermented foods, hand crafted soaps and nutritious fruit spreads. Ground Floor Farm demonstrated how to create kimchi and Hani Honey took guests up close and personal with a working bee hive used to produce their popular local honey. Fresh produce from House of Hope’s aeroponic greenhouse and production garden was also featured. Fictitious identities were assigned to 75 participants for the first ever Dare to Care Poverty Simulation held Jan. 17 at the Chastain Campus of Indian River State College. Notables from local government, law enforcement, education institutions, media, nonprofits and faith-based organizations played roles ranging from 7 year old impoverished children to 89 year old retirees struggling to make ends meet. Several private citizens and partner agency representatives added to the diverse group ensuring a wide variety of backgrounds and perceptions being brought to the table. The objective was to provide a unique learning experience for changing perceptions, inspiring empathy, and facilitating solution based thinking regarding local poverty issues. Check back for information about our next Dare to Care: Poverty Simulation being hosted in April 2018. 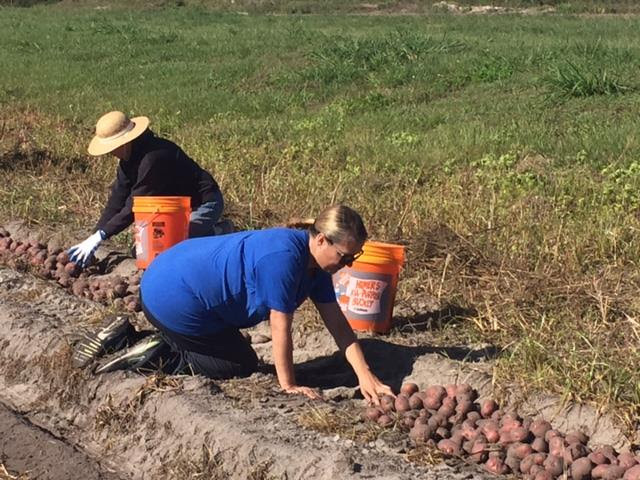 We are now accepting sign-ups for gleaning volunteer opportunities! Gleaning is harvesting fresh produce remaining at the farm after a field has been professionally picked. This produce is often smaller or larger than what supermarkets consider “shelf-worthy” but it is still just as nutritious! Once harvested, the produce is distributed to our pantries instead of being plowed back into the soil. Volunteer today to help us keep nutritious fruits and vegetables available for our pantry clients. For more information or to sign up, click here or contact Lauren Mustelier at (772) 286 - 4673 x 1004.